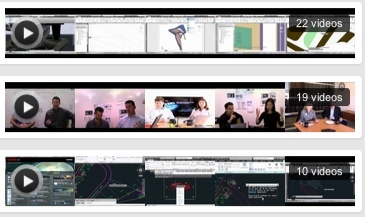 Autodesk has had a YouTube Channel for AutoCAD for some time. You may not have visited it before and I suggest you take some time to see what is there. You could start off with a few small business testimonies of how CAD technology is empowering the firms to make some really cool stuff. Check out these short video interviews that share the tools and output. Some are really impressive. http://www.youtube.com/playlist?list=PL3FE8B8A28B25CA4E&feature=view_all . It is always interesting to find out how others are using the tools that you use and what other industries are taking advantage of the technology. Here are a few others that might be worth checking out. There are quite a few videos on the Channel. Take a look.